This report was originally posted on the USAID website and then subsequently removed without explanation. According to the Federation of American Scientists’ Steven Aftergood, this was because several of the documents cited in the report have since been classified and, therefore, the report itself has become classified. Dubai real estate led depositors to rush to withdraw funds from Kabul Bank, the largest bank in Afghanistan. According to the Report of Kabul Bank in Conservatorship dated October 30, 2010, cited in a draft material loss review commissioned by USAID/Afghanistan, fraudulent loans were used to divert $850 million to insiders. This amount reportedly represented 94 percent of the bank’s outstanding loans. ADS 203.3.2, ―Assessing and Learning, states that missions and their offices are responsible for monitoring a contractor’s performance in achieving the contract’s purpose. ADS 302.3.7.1a, ―Direct Contracting, Mandatory Reference: ―Procedures for Designating the Contracting Officer’s Technical Representative (COTR) for Contracts and Task Orders,‖ states that the COTR is in a unique position to monitor how well the contractor is progressing toward achieving the contract’s purpose and is responsible for providing technical liaison between the contractor and the contracting officer, a function critical to ensuring good contract performance. 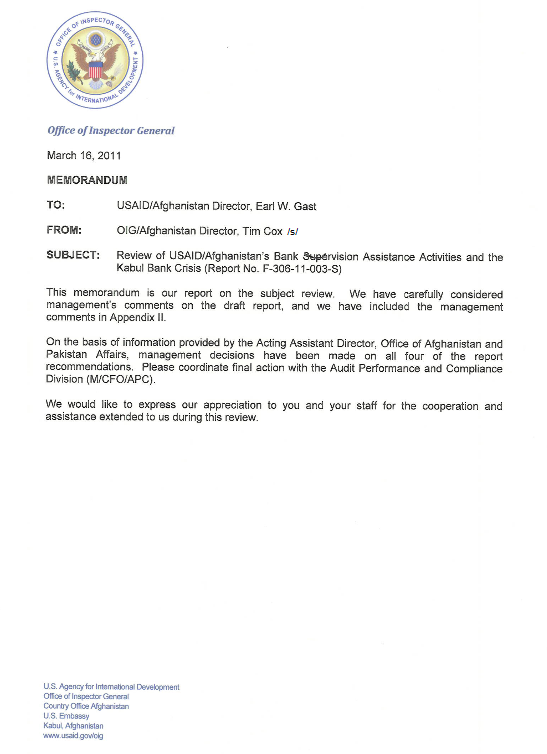 When the current mission director arrived in June 2010, his attention focused on USAID/Afghanistan’s capacity to manage and provide oversight of highly technical bank supervision activities implemented by its contractor, Deloitte, at DAB. This focus heightened after the Kabul Bank crisis broke in September 2010. The task order with Deloitte for the Economic Growth and Governance Initiative was for a 5-year, $92 million project with three major components and 21 work streams with diverse requirements that was managed by USAID/Afghanistan’s Office of Economic Growth. In August 2009, when USAID issued the task order, the Office of Economic Growth had only four U.S. direct-hire staff and none with experience in the banking sector. For the most part, only one U.S. direct hire was managing the task order at any given time, with some assistance from Foreign Service National staff. Further contributing to the mission’s challenges to provide effective oversight of Deloitte, a former COTR for the Deloitte task order stated that during a typical workweek, he spent 50 to 70 percent of his time drafting memorandums and cables for the U.S. Embassy, reducing his time for program oversight. He kept detailed timesheets of daily work activities. The COTR explained that such competing work demands, combined with the mission’s lack of technical expertise, created overreliance on the Deloitte advisers to manage the bank supervision assistance activities, with little oversight provided by USAID. USAID staff members stated that had they not faced the burden of managing a large task order with limited resources, they would have been in a better position to provide proactive and robust oversight of the Deloitte advisers. As one USAID official put it, ―Deloitte was managing USAID, rather than the other way around. Generally, COTRs monitor contractor performance and verify that it conforms to the technical requirements and quality standards agreed to in the contract. COTRs do this by maintaining regular contact and liaison and by conducting frequent site visits with the contractor. Yet according to a former COTR for the Deloitte task order, mission management focused on program spending, financial pipelines, and burn rates, rather than on monitoring and achieving program results. A former USAID/Afghanistan staff member stated in a memo that the mission gave the Office of Economic Growth only 24 hours to review a proposed Deloitte work plan—insufficient time to provide thoughtful review and comment. Finally, at the entrance conference for this review, USAID/Afghanistan officials did not take a position on whether Deloitte’s performance was satisfactory or unsatisfactory, providing further evidence of inadequate management. For years, USAID has faced difficulty in attracting staff to Afghanistan who have the appropriate levels of experience and skills. A former mission director for USAID/Afghanistan stated that the staffing situation in Afghanistan reflected what he considered to be an ongoing problem for USAID, especially for programs in war zones—not enough senior people at USAID who have the experience to manage large, substantive, technically challenging projects. Current USAID/Afghanistan leadership agreed with this assessment and explained that steps have been and continue to be taken to remedy that situation. For example, a recently completed reorganization in the Office of Economic Growth added one technical adviser position.